Eight two-hour classes per semester consist of gallery tours and studio art classes. Topics include portraiture, landscape and still life painting, collage and more, with age-appropriate art appreciation and art history. 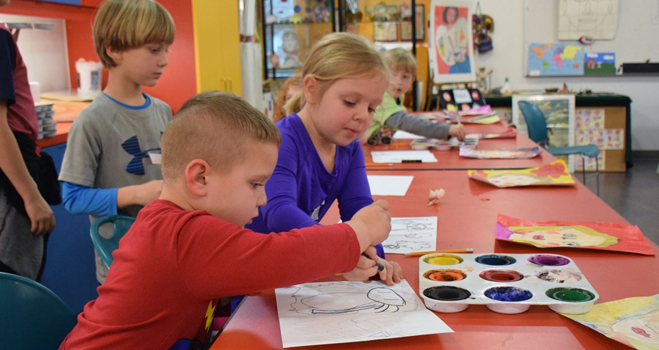 Art Splash [ages 4 – 7] TUES, WED, THURS, 1 – 3 P.M.
Art Splash students explore basic elements of art – color, line and shape – through hands-on art activities that relate core curriculum subjects to studio art and art appreciation. Mid Level [ages 8 – 13] TUES, WED, THURS, 1 – 3 P.M. Mid-level students review basic elements of art, while using a variety of mediums and artistic techniques to create original pieces of art. Studio art classes incorporate art history and core curriculum subjects in each lesson plan. Upper Level [age 14+] THURSDAYS ONLY, 4 – 6 P.M.
Upper-level students are introduced to a more in-depth study of art history, with curriculum-based classes that explore more sophisticated principles of art, while the students create original art pieces. None of the MMofA classes requires previous art training. Classes are equally beneficial to the novice and to the experienced young artist! Art Splash and Mid Level classes are held every two weeks in the MMofA Education Wing from 1 p.m. until 3 p.m. Upper Level classes are also held every two weeks from 4 p.m. until 6 p.m. Art Splash and Mid Level students may choose between a Tuesday, Wednesday, or Thursday class, while Upper Level classes are only held on Thursdays. The cost for MMofA members is $90 for the first child, and $25 for each sibling thereafter. The Cost for non-members is $110 for the first child, and $35 for each sibling thereafter. Call Kim Wood at 251.208.5212 or email kwood@cityofmobile.org to register. This is a fabulous, user friendly site filled with worldwide comprehensive resources for the home educator.